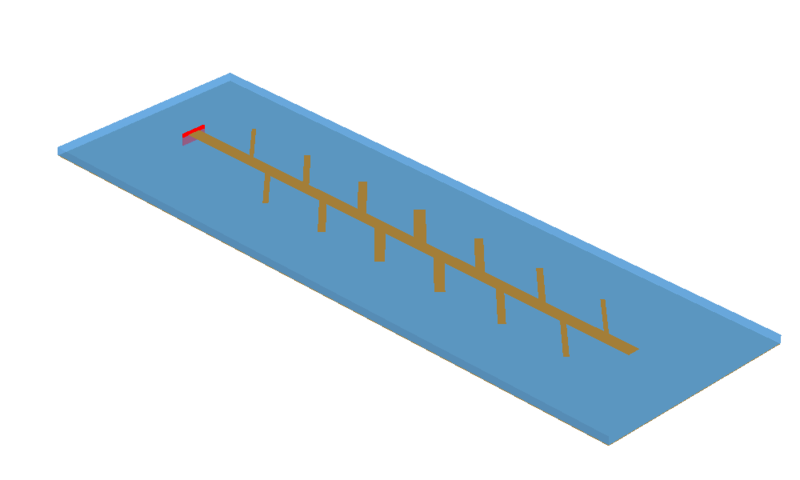 Image of the Combline Microstrip Stub Array. Automotive RADAR systems are classed according to operating range into three main types, namely long-range (LRR), medium-range (MRR) and short-range RADAR (SRR). A LRR system is typically mounted on the front of a vehicle to detect objects up to 250m ahead, and thus requires a low-profile high gain antenna with a narrow beamwidth. A suitable candidate antenna for LRR is the combline stub array. 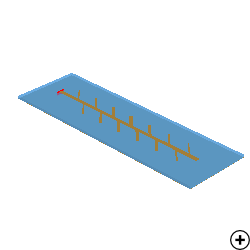 A typical design (13 elements) produces a high gain fan beam radiation pattern with a narrow 12.5 degree beamwidth. In an attempt to minimise interference from other RADAR systems from oncoming vehicles, the stubs of the array are rotated by 45 degrees from the normal position. A taper applied to the elements further enhances the performance of the antenna. A Taylor distribution provides the best compromise between beamwidth and sidelobe level, while a Villeneuve taper results in the best reflection response.